Ukraine is not only a territory with a beautiful nature; Ukraine is people who shape the face of its history and is a bridge to the future. Taras Shevchenko and Ilya Repin are such people. They both were born on the territory of Ukraine and glorified it in their own manner. 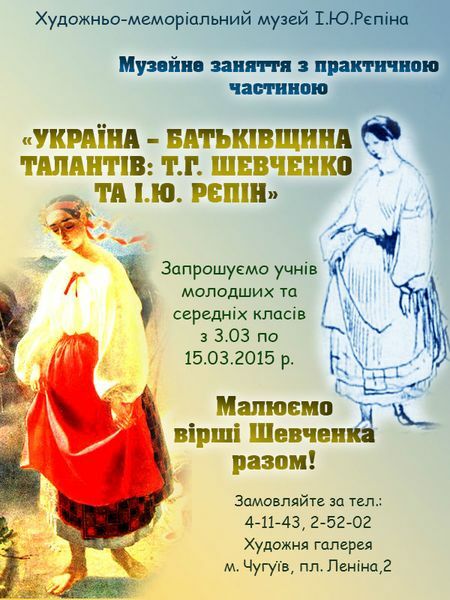 The Art gallery invites pupils to visit a museum class "Ukraine is the birthplace of talents: T.G. Shevchenko and I.E. Repin". In the class children will learn interesting facts about Shevchenko and Repin. During the practical part, which called "Let's draw Shevchenko poems" children will try themselves as illustrators. They will create cards with illustrations of famous Taras's poems. At the end of the class we will organize an exhibition of children's drawings and take pictures!